The remaining rebel-held areas of Deraa and Quneitra are currently witnessing the beginning of a military campaign by the Syrian government to retake those areas, with heavy bombardment and displacement in the eastern Deraa countryside in particular. How did we get to this stage and what is the likely outcome? Perhaps the foremost issue for discussion is Russia's role in this matter. In my view, there has been an analytical failure in understanding Russia's goals in the "de-escalation" arrangement for southern Syria. The first step in the arrangement was a ceasefire for the region that was agreed between Russia, the U.S. and Jordan in July 2017. The ceasefire was followed up by a "Memorandum of Principles" between the three powers in November 2017. To be sure, there are no copies of the texts of the ceasefire agreement and "Memorandum of Principles" in the open source realm, but it cannot be plausibly argued that Russia's intention in particular was simply to freeze indefinitely the frontlines and zones of control in the south as part of a balancing act between different parties. An example of this misconception can be found in an article in Foreign Policy a month ago. The article argued that "a frozen conflict" in Syria may have been the goal all along for Russia. On the southern situation in particular, the article painted a simple portrait of Iran pushing the government for a military assault on the south, whereas Russia supposedly had no interest in that outcome. Such an analysis is superficial on multiple levels. For example, when it came to the south, the Syrian government did not presume that military assault was the only option to bring back areas under its control. 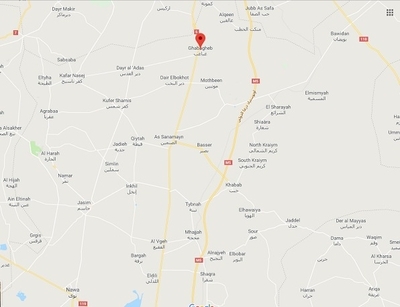 Instead, the government has promoted what one might call "soft reconciliation" as a model for the south, as could be observed in the town of al-Sanamayn in north Deraa, which never entirely fell out of government control and was located within a wider zone of government control. The reconciliation agreement in al-Sanamayn at the end of 2016 did involve application of some siege pressure in response to the violation of a de facto truce, but there was no full-on assault, contrasting with (for example) East Ghouta and east Aleppo city. Under the reconciliation, the factions in al-Sanamayn have largely been left as they were prior to the reconciliation. Thus, these factions are mostly responsible for running internal security in the town. There are some serious problems surrounding the al-Sanamayn reconciliation. For example, though some people underwent taswiyat al-wad' ("sorting out affairs/regularizing status") as part of the reconciliation, that does not permanently resolve the problem of being wanted for military service. In addition, al-Sanamayn continues to witness security problems on account of clan issues and the presence of multiple armed groups. No unified security force has been formed by the factions of al-Sanamayn to impose law and order despite repeated discussions of the matter. Earlier this year, tensions between the government and the rebels in al-Sanamayn escalated on account of the disappearance of a non-commissioned military officer. Further, the car of the commander of the 9th division of the Syrian army was targeted with gunfire. As a result, the 9th division, whose main base is located in the al-Sanamayn area, threatened an assault against the rebel factions in the town. There was also talk of imposing a second, more comprehensive reconciliation (i.e. requiring more weapons to be handed over and for more people to undergo taswiyat al-wad'). Yet the 9th division backed down in the end, and the second reconciliation never happened. Nevertheless, these details- and the wider debates about the pros and cons of reconciliation agreements and their final status- do not detract from the point that the Syrian government saw a way forward in reconciliation agreements for the south that would have local rebel faction buy-in and not necessarily require a full-blown military campaign. It is unlikely that Russia, which also gets involved in reconciliation agreements, has not been encouraging such initiatives and negotiations as the preferred option for dealing with the rebel-held areas of the south. More broadly, it needs to be understood that Russia's involvement in de-escalation for the south has been predicated on the idea of advancing the interests of its ally- the Syrian government- in that area in some form, even as it is correct to note that the concerns of Jordan and Israel were also being taken into account. Indeed, one can see hints of the Russian goals in the limited public material on the ideas behind the southern de-escalation. For instance, consider the joint U.S.-Russia announcement on the November 2017 memorandum. The announcement affirms that de-escalation is an "interim step to reduce violence in Syria, enforce ceasefire agreements, facilitate unhindered humanitarian access, and set the conditions for the ultimate political solution to the conflict." One can dismiss the last point as a political trope, and different parties will have differing views of what a "political solution" means. But the inclusion of that point shows an intention to build on the southern de-escalation for a final status resolution for that region. Notable as well is the commitment in the memorandum to Syria's sovereignty, unity, independence and territorial integrity. Again, one could dismiss all that as a political trope, but from Russia's perspective, it does illustrate a desire to bring back those rebel-held areas in the south under formal government control in some way. Ultimately though, there was no progress for the southern de-escalation beyond the November 2017 memorandum. Nor did reconciliation agreements along the al-Sanamayn model make headway beyond Deraa localities in similar geographic/strategic circumstances to al-Sanamayn (most notably Mahajja and Ghabaghib) that are not applicable to the wider rebel-held south. One can discuss in detail the reasons for lack of progress in resolving the south's political status and lack of acceptance of reconciliation deals, but the Russian and Syrian government perspective is that the U.S. and the West are to blame for the impasse. In April 2018, Maria Zakharova, the Russian Foreign Ministry spokesperson, claimed that southern rebels were aiming for the "creation of a territorial entity there [in the south] with the capital in Deraa, under the auspices of the United States, which will be independent from Damascus, similar to the areas controlled by the Syrian Democratic Forces in the northeast of the country." Bashar al-Assad, in an interview with the Mail on Sunday earlier this month, commented on the failure of last-ditch efforts to achieve reconciliation in the south. Assad claimed that "the West interfered and asked the terrorists not to follow this path [of reconciliation] in order to prolong the Syrian conflict." In other words, the Syrian government and its Russian allies consider the southern rebellion to be a separatist project undermining Syria's unity and territorial integrity: a perception that has not been taken seriously enough in the analytical picture. Map illustrating the locations of al-Sanamayn, Ghabaghib and Mahajja in the wider south. The point here is not to justify the Syrian government and Russian views and narratives. Rather, the discussion here simply illustrates why the idea that Russia was going to enforce the southern status quo indefinitely and bar Syrian military action under all circumstances for the sake of "upholding the ceasefire" and/or in deference to other outside powers like Israel was folly. From the outset, Russia would not have entered into the southern de-escalation arrangement if it did not think it could ultimately serve the interests of the Syrian government. 1. Military intervention to deter an offensive against the rebels and maintain the previous status quo. At the very minimum, this would mean airstrikes against Syrian government forces. 2. Pursue negotiations for a diplomatic resolution to the southern situation. Whatever course is pursued, the goals and future visions have to be articulated clearly, honestly and consistently. In the case of option 1, it does no good to issue vague commitments to "upholding the ceasefire" without any action to back it up. As far as the long-term future outlook goes in the option 1 scenario, it would be questionable why indefinite rebel-held zones in the south should even be considered part of Syria. As for option 2, it should be frankly acknowledged that the end outcome of it is the return of Syrian government control to the south. Of course, the government presence never entirely vanished from the rebel-held areas in the south- note that school teachers were still receiving salaries from the government, for example- but the negotiations would inevitably lead to a more extensive government presence and functioning in the south, displacing the influence of opposition local councils and the interim government. Option 3 likewise leads to a return of the Syrian government to the south, though at a much greater humanitarian cost and under harsher reconciliations than option 2. I am not so much in the business of policy recommendations. My own analytical outlook is that option 3 is the scenario that will be realized, and so the rebel-held south is doomed. The final confrontation in the south will therefore be between the Syrian government and the Islamic State affiliate Jaysh Khalid bin al-Waleed (JKBW), whose supporters have long condemned the rebels at war with JKBW for supposedly holding JKBW back from fighting the government. Indeed, JKBW appears to be anticipating the end of the rebel-held south (which has proven incapable of defeating JKBW) and a forthcoming fight with the government, as a JKBW recruitment form for fighting the Syrian government recently surfaced. Of course, the persistence of JKBW adds to a Syrian government/Russian casus belli, in that the argument can be made that only the Syrian army and its allies can truly defeat the Islamic State in southern Syria. As a more general lesson, I would caution against assuming a strict dichotomy of "Syrian government and Iranian desire for military reconquest vs. Russian pragmatism." As outlined above, military campaigns are not viewed as the sole means for regaining territory. Further, Russian complaints of violation of Syrian sovereignty and territorial integrity should not be dismissed as mere rhetoric. Nor should it be thought that Russia enters into negotiations and agreements with other outside powers like the Astana process and disregards the Syrian government's desire to reassert control over all of Syria. It does not follow from the preceding that the Syrian government and its allies are all perfectly aligned with each other. Nor is it the case that there is a brilliant Russian master-plan for the Syrian government to retake all of Syria's territory. Indeed, there cannot be such a master-plan, as there are certain circumstances that have arisen in the Syrian civil war that are ultimately beyond Russia's control (e.g. the question of whether U.S. maintains its presence in the north and northeast of Syria, which the U.S., if it so desires, can impose unilaterally for an indefinite period). But at the same time, it is implausible that there was a Russian master-plan all along to keep Syria stuck in de facto partition and frozen conflict.